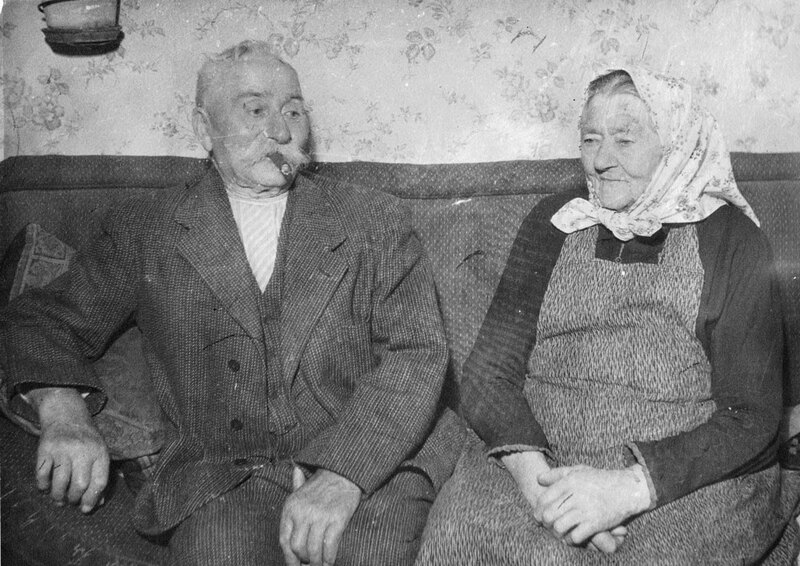 Christian Holm and Anna Larsen, my grandparents (“Bedstefar and Bedstemor”) were married in 1887. At first they lived with his parents, and it was there that their first son was born. His grandmother in her wisdom made him a soother containing rye bread dipped in brandy; this troubled his mother, she had seen too much of brandy in her childhood home – but how could a young wife stand up to a mother-in-law who had brought up seven children? In 1891 or 1892 they purchased a property of 11 acres in Povlsker and began to farm it, but the venture was unsuccessful. Dad remembers his father as being a hard worker but a poor businessman. One day he bought a beautiful young horse, but when he tried to take it home the animal would not move; it responded to neither carrot nor stick, and Dad said that even lighting a fire under it would not have made it obey. Grandfather had to trade it in for another horse and took a considerable loss. This type of event took place too often, and the family had to sell their farm. On another occasion (I don’t know precisely when) Bedstefar wanted to buy a larger farm than the one they had, but Bedstemor thought the risk would be too great, so the purchase was never made. It would probably have been better if Grandmother had managed the family finances. Poor business sense appears to have been a trait among some of my Holm ancestors. Bedstemor was humble and asked little for herself. Farm labourers in her childhood circumstances thought themselves comfortable and secure if they owned a small house and barn with two or three acres of land so they could keep a pig and a cow, some hens and a garden; they would have this to fall back on when work ran out on the farm where they normally worked as labourers. Such a property was called a “husmandsted”, literally “housemanplace”, and was the smallest of a number of sizes of farm holdings. Bedstemor was content with little more than that. In 1907 the family moved to Neksø, where Grandfather worked as a labourer in construction. There they bought one third of an old farm building on the edge of town and used it as a family dwelling. They paid 23,000 Kr. for the property, improved it and sold it four years later for 28,000 Kr. Grandfather earned 30 ore (6-7 cents) per hour. He alternated between farming and the building trades for most of his life, but in time found both jobs too difficult for his legs. He had inherited the family weakness. In 1911 they purchased Lille Pilegård (Little Willow Farm) in Povlsker at the southern tip of Bornholm. Dad said it consisted of about 85 acres of farm land, sand dunes and shoreline. There they generally kept about 18 head of cattle. Some papers in the possession of my cousin Viggo show that they paid 18,000 Kr. for the property, of which 10,000 Kr. was in the form of a mortgage. The land and buildings cost them 15,000 Kr., and the remaining 3,000 Kr. covered stoves, stock, machinery and shares in a creamery and an abattoir. There was a walnut tree on the property, but Bedstefar cut it down; he had little appreciation of things that were out of the ordinary. Lille Pilegård had been occupied by an elderly couple who had done their cooking in a fireplace and had not kept up with the times. The house was frightfully dirty. Hansine, who was 15 at the time and had a temper, was disgusted. She angrily and tearfully attacked the kitchen floor, scrubbing it with fine sand from the beach. The family soon installed a wood stove. The older boys slept in an unheated room in the barn, the younger ones on trundle beds in the living room. Soon Grandfather was not able to work in the fields, but he managed to reconstruct the buildings and increase the value of the property considerably. Grandmother and the children did the field work. Grandfather’s legs gave him so much trouble that they had to give up the farm altogether. From 1915 until 1934 they looked after a community hall, “Forsamlingshuset Frem”. They lived there rent-free and were paid whenever meetings were held. 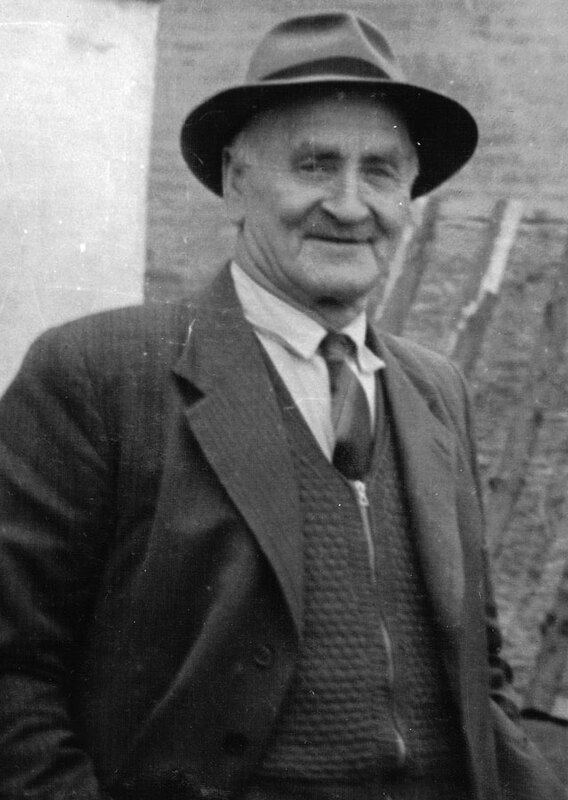 Grandfather did some light construction work in the summer, in business for himself, rebuilding stables, etc., and making about one krone (25 cents) per day. In the winter, when walking was more difficult, he worked at home as a tinsmith. They had a garden, a pig and some hens. In 1934 they retired and moved to Snogebæk where they lived with their youngest daughter Sofie and her husband Julius Pedersen, who had just returned after four years in Nova Scotia. Later they moved to a small house on the property of their oldest son Alfred. There they died, he in March 1951 and she in December 1952. Apparently there are divided opinions in the family as to the reasons for the move to Alfred’s. It seems that the grandchildren at Snogebæk were unruly and hard for old people to put up with. At Snogebæk, Grandmother in her old age washed dishes and generally made herself useful, although Sofie sometimes had to rewash the dishes during Grandmother’s nap because the old eyes hadn’t seen all the dirt. At Alfred’s she looked after the cottage where they lived. Grandfather tended to be irritable and in his old age would lash out with his cane when the youngsters became unruly. His hearing was acute and he could understand every word said by the children. Grandmother was hard of hearing. Sometimes it is a blessing to be deaf. Alfred wrote, when his mother was in her eighties, that she was complaining because she couldn’t work any more. He said she meant that she couldn’t pitch hay and hoe turnips. She could only get the meals for herself and Grandfather and keep their rooms clean. Grandmother was patient and kind, asking for herself only the bare essentials. At the age of five she had to go to work on a large farm to earn her keep, herding geese, sheep, etc. If she failed to perform her tasks adequately, her boss would ride up on horseback and whip her legs. Sometimes she would get caught in a rainstorm and come in from the fields soaking wet; there was no one to provide her with dry clothing, so she would place her slip under the sheet in her bed and it would be warm in the morning. Grandmother was six when her father brought home the clothes he had taken from “Ellestokken”. She must have benefited from her mother’s sewing on that occasion. Dad remembered how in his childhood she would spread the margarine on her bread very thinly so there would be more for the children. No one could peel a potato or an apple and remove so little of the pulp with the peeling. For the last fifty years of her life Bedstemor didn’t have a tooth in her head; like most rural women of her day she never did get dentures – perhaps it never occurred to her that she should. When her husband got new reading glasses she inherited his old ones. In spite of brutal treatment and extreme poverty in her youth, Grandmother learned to enjoy the finer things of life. In her mature years she had a set of delicate china, some of which became Mother’s. It was beautiful. I have the two remaining cups. In 1814 universal education became the law in Denmark; every parish was to have a school. It took some years before the system was extended to isolated parts of the country such as Eastern Bornholm, but it must have been general during her parents’ childhood. Even her great-grandfather, as a master blacksmith, could surely read and write. In his day the large landowners would hire a teacher for their own children for several months at a time, and would invite the other youngsters of the neighbourhood to attend. By the 1860s education was better organized. Bedstemor probably went to school six hours a day, three days a week for seven years. In Dad’s youth this was still standard practice in the rural areas, and the teacher taught another class on the other three days. Bedstemor’s handwriting was neat, even in her old age. She wrote me a short note when she was 91, and I still have it. 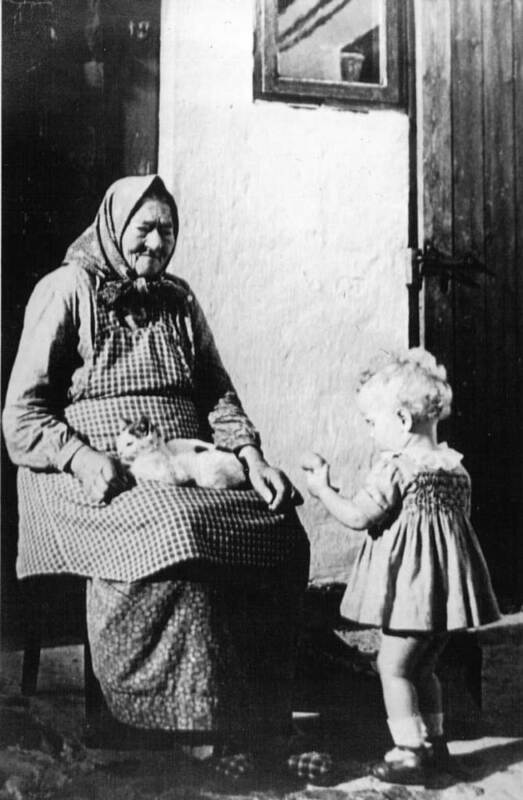 During my trip to Denmark in 1980 I asked my cousin Birthe what Grandmother was like and she told me this story. One day, while the old folks were living with Birthe and her parents at Snogebæk they heard that the local Methodist minister was coming from Nekse for a visit and was bringing his little boy. The boy was known to be rough with small animals. There was a new litter of kittens on the property, and Grandmother, without saying a word to anyone, hid the kittens and kept them hidden until the boy had left. Then the kittens just as quietly reappeared. That, said Birthe, was typical of Bedstemor. She was a quiet woman; life could go on without much talk. But her face would light up with a warm smile, and she had a quiet sense of humour. Dad remembered her telling a story of a woman who was proud that her soldier son had been promoted; he had been made an admiral or a general or a corporal – the mother couldn’t remember which it was. But Grandmother didn’t generally tell jokes. She had her own gentle way with children and grandchildren. Once while her own children – or most of them – were still at home she needed something at the store, and asked them if one of them would do the errand for her. But they were all busy with their own pursuits and no one volunteered. A little while later they saw her putting on her coat. Where was she going? they asked. Oh, she said, she had to get something at the store, and since they were all too busy to go, she would do it herself. Then they all wanted to go; they loved her too much to let her down. She knew how to maintain harmony and cooperation in the home. Dad idolized her, as did most of her children and grandchildren; I know of only one grandchild who felt more attracted to Grandfather. In all her 92 years and six months Grandmother never left the Island of Bornholm. She never had a reason to go “over”. Niels Christian Holm was of medium height, stocky, egg-shaped and erect. He had a round face with a receding chin, and wore a short beard, carefully trimmed. He had a wave in his hair – a cowlick (in Bornholmsk a “tjyraslik” or bull-lick) – which he combed carefully. He smoked heavily – a pipe and the occasional cigar, but had the usual pipe- smoker’s disdain for cigarettes. In his old age however, when he felt the price of tobacco was rising excessively, he stopped smoking completely; or rather he stopped buying, for he was not averse to bumming a cigarette from a grandson. He defended his smoking by saying that since God had created tobacco there must be some value in using it. He was a teetotaller. In his old age he developed a skin cancer on his nose, and travelled to Copenhagen for treatment. Grandfather was friendly and gregarious, kind and generous. But in his old age he tended to become impatient and critical of the younger generation and the modern ways. Grandmother would occasionally urge him gently to remember their own youth; whatever she had in mind, the words were enough to stop his criticism The pains in his legs tended to sour his disposition. Grandmother was a steadying influence on him, and it was fortunate that she outlived him. Bedstemor was a good singer. Bedstefar was not, but he tried. Through Tante Bolette and Onkel Hans Andreasen my grandparents were drawn to the Methodist Church. Bornholm, like many isolated places where living was difficult and sometimes dangerous, tended to be strongly religious, and the Methodist, Baptist, Pentecostal and other free churches as well as dissident sects of the Lutheran Church found fertile ground there. In 1894 a Methodist church was built in Neksø, and halls in the villages and country communities were filled to overflowing as people gathered to hear the winsome “sensible proclamation of sin and grace”, as a Lutheran theologian described the Methodist preaching. The Methodist cause had been brought to Denmark by Danes who had been converted in the United States and returned home; some of them had been ordained in America. The first such minister, Christian Willerup, founded the Jerusalem congregation in Copenhagen in 1850. For many years the Scandinavian church was a mission with oversight given by American bishops, but after the First World War a Dane, Anton Bast, was chosen to be Bishop of Norway, Sweden, Denmark and Finland. The Danish Methodist Church has always been small in membership, but in the early days drew many adherents and has exerted a powerful social influence. At one Methodist meeting where there was an overflow crowd my grandparents heard the preacher suggest to the audience that all those who had managed to get seats that night should stay home the following night so there would be room for other needy souls. They found the suggestion unusual but sensible. The seven children were baptised Lutheran, but the five younger ones were brought up in the Methodist Church and more or less found their home there. The Neksø circuit consisted of the town church and about a dozen small rural and village preaching places. The minister was assisted by several local preachers, including one Lars Dam whom my father remembered fondly as his Sunday school superintendent. Dam would stand with his thumbs in his trouser pockets and speak quietly to the children, and now and then a tear would roll down his cheek as he told them of the love of God in Jesus Christ. Apparently Grandmother had danced in her youth, but when she became a Methodist she ceased such worldly frivolity. Occasionally Sofie, her youngest daughter, would prevail on her to execute a few steps. She was opposed to card-playing, and on one occasion burned a deck of cards which Ludvig had brought home. Her early experience of card- playing had been of her fathers gambling and losing money that would have been better used to feed and clothe his family. It goes without saying that she was also opposed to the use of alcoholic beverages. The Methodists were not killjoys, however. Sunday school picnics and similar excursions were held on Sunday afternoons, usually in Almindingen, the forest at the center of the Island, with ballgames and races and other similar activities. The Methodists on Bornholm had a band, and it was active on such occasions. Not for them the dreary Presbyterian Sabbath. Their enthusiasm and joie de vivre, and above all their appreciation of the Gospel, made dancing, drinking and card-playing superfluous. The phrase, “the expulsive power of a strong affection” comes to mind; they felt that power. Being country folk, the family knew how to make the most of field and garden. During my father’s childhood the meat most often used was pork; a pig was butchered and the meat salted, or occasionally smoked. The salt pork was fat and they either roasted or boiled it. Sometimes however the family pig had to be sold in order to make ends meet; then salt fish and pickled herring would take the place of pork. Potatoes, carrots, cabbage, peas and pumpkin were used. Oatmeal porridge and tomatoes were introduced during Dad’s childhood. Beans were cut small and salted; beans and cabbage were stewed in a white sauce and cabbage soup was common. Cucumbers and beets were pickled. Øllebrød was commonly used – a porridge made from rye bread and a non-alcoholic beer. Rendered pork fat made an inexpensive spread. Margarine and skim milk were used; the whole milk was sent to the creamery where the cream was made into butter and the skim milk returned to the farm. Rye bread was standard fare. White bread and butter were unusual. The family always had at least one sheep, and Bedstemor used the wool to make socks etc. for the family, doing her own carding and spinning. In the family home there were alcoves off the living room with beds in them and curtains in front, and the adults slept there. Children often slept on benches in the living room; there were drawers under the benches and these were pulled out to make additional bed space. (2) Uncles and Aunts – and Cousins by the Dozens. My father, Viggo Valdemar Holm, had three brothers, three sisters and one foster sister. He had 24 nieces and nephews. Life was difficult for children growing up in rural Bornholm in the 1800s. Alfred, Dad’s oldest brother, left home to work for his keep at the age of eight. He married his cousin Hansine, daughter of Onkel Georg Holm. 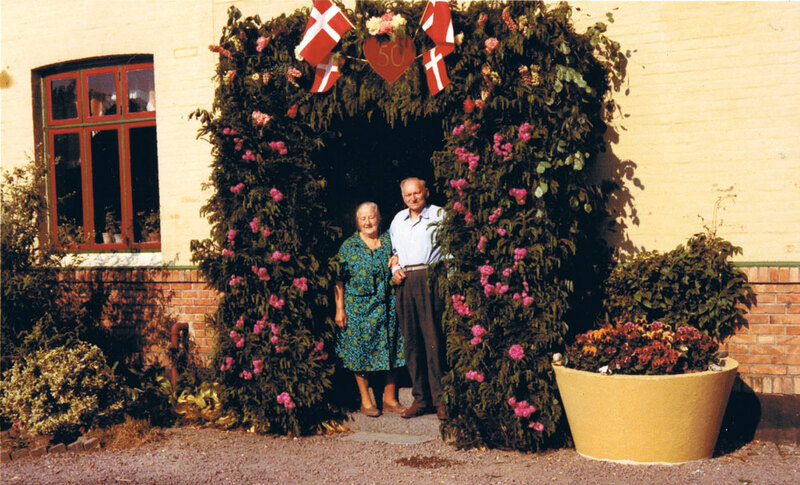 Alfred and Hansine farmed for many years at Povlsker and brought up their family there. They belonged to the Home Mission (Indremissionen) a sect of the Lutheran Church, and in later years looked after the mission property at Bodilsker. Alfred, like his father, also worked in the building trades; he did rough carpentry, mostly on farms. He was strong and a good worker, but found it hard to get up in the morning; the cattle suffered when they were not fed and milked on time. For this reason, when Bedstefar had to give up farming he refused to let his oldest son take over Lille Pilegård; instead he turned it over to Ludvig. As Alfred grew older he became dependent on canes. He was apparently diagnosed as having a circulatory problem, but I suspect it may have been muscular dystrophy. Hansine had a back ailment, probably scoliosis. Was there a connection? Their mutual grandmother had mobility problems. Alfred’s daughter Margit and her husband Alfred Hansen had four children and farmed at Povlsker. She died of cancer at age 60. 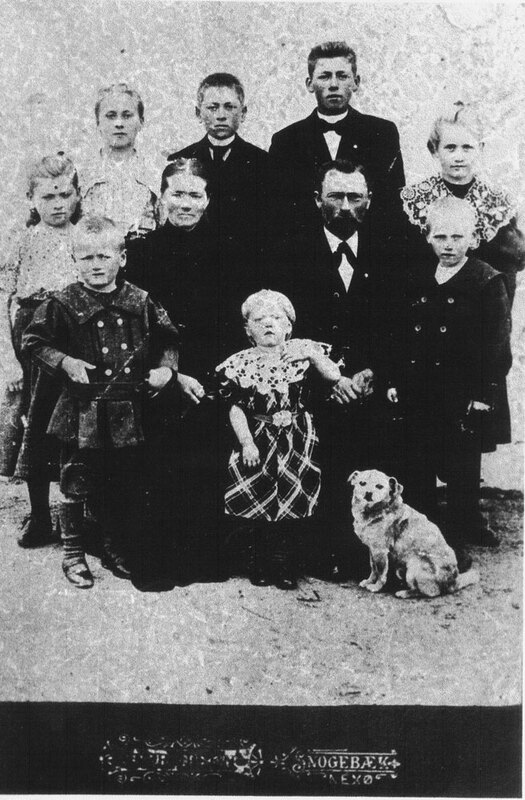 Helmer married Gunhild Pedersen and they had four children; they have farmed at Bodilsker and are members of the Home Mission. Erwin was a postman, living at Bodilsker, and an active local preacher in the Methodist Church; his wife was Tonny Madsen and they have one son. When I was in Denmark in 1980 Erwin gave me two lamp brackets he had made on his lathe; I still have them. Ludvig married lngeborg Johansen. From 1915 to 1946 he farmed Lille Pilegård, then sold the farm to his son Viggo. In its prime they had about 40 milk cows, 8-10 steers, 40-50 pigs, some geese and ducks and 2-3 horses. Also some fruit trees. Hans Conrad was married unsuccessfully in Denmark. In 1948 he migrated to Canada,: settling after a time in the Vancouver area where he engaged in the building trades. At time of writing he is living in retirement in White Rock, B.C. He married June Kofoed, the adopted daughter of Bornholmsk immigrants, and they have five children. Ludvig’s second son, Viggo, married Eva Hansen. They farmed Lille Pilegård for some years, then moved to Klemensker, and are now living in retirement in Rønne. Inger married Ragner Hjordt Jensen, a bricklayer. He is now dead, and she is living in Gem, Jutland. Grethe and her husband, Rickard Petersen and their four sons built up a sizeable factory in Gem, producing office equipment. They are both dead. Ludvig was about six feet tall, the tallest in the family, strong, handsome, kind, popular, erect. He was known to have shouldered bags of grain weighing more than 150 lbs and to have carried them down the road to the mill. He kept himself slim; his motto was to always leave room for one more slice of ryebread at the end of a meal. Like Bedstefar, he was gregarious and sociable. lngeborg’s nerves were always delicate and life was difficult for both of them. Ludvig cared for her patiently. When she raged at him he would stomp out in his wooden shoes, whistling, “I wish I were single again”. lngeborg was very stout, and Ludvig would say that his arms would not reach around her; he had to embrace her in stages. She spent the last years of her life in a mental hospital. I once suggested to Mother that if there was a black sheep in Dad’s family it was Ludvig. She replied, “Oh yes, but he was so nice.” In his youth Ludvig fathered a son out of wedlock and for many years contributed to his support. After lngeborg’s death he lived common-law with a lady-friend. Occurrences common enough today perhaps, but less respectable in his generation. He and his family were less involved in organized religion than were the other branches of the clan. Ludvig’s was a free and happy spirit. In his retirement Ludvig paid three visits to Canada, spending time with my parents and with Hans and June in British Columbia. On one occasion he was accompanied by Inger; on another by Unsa, his lady friend. While visiting my parents at the Atlantic Christian Training Centre he helped Dad build the concrete walk down the hill from the side door of Stewart Hall. At the age of 92 years and five months Ludvig underwent an operation for an obstruction of the bowel and was recovering nicely, but died a few days later when a blood clot formed. Bedstemor still holds the record for longevity in that family – 92 years and six months. Anine was the oldest of Dad’s sisters. She went out to work when she was nine. One of her tasks was to milk her employer’s family cow; an old grandmother who lived in the house went with her and held the lantern so she could see what she was doing. 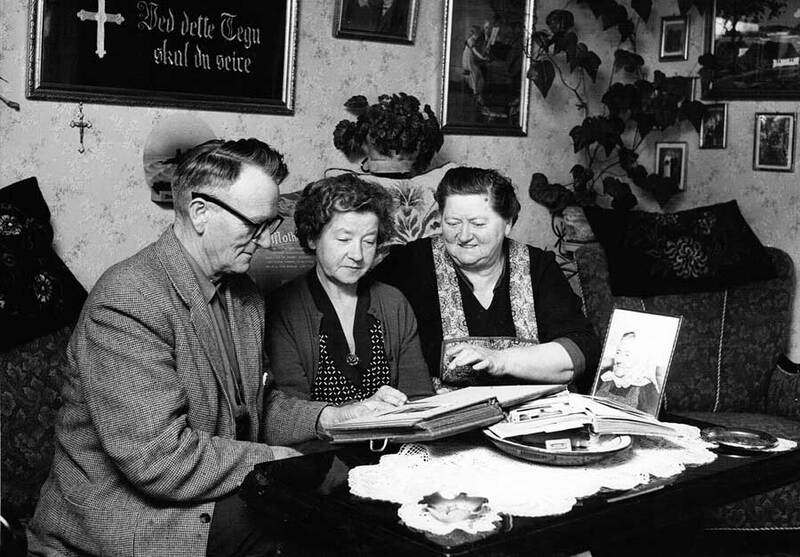 Anine and her husband Hans Pedersen were living at Tvillingehusene (“the Twin Houses”) near Akirkeby when their twins were born – on February 29, 1920. Later two other sons were to share a birthday, five years apart. Hans was a farm labourer. They were quiet, unassuming people. Anine was much like Bedstemor. We have at least two items of needlework done by Anine. Osvald, one of the twins, farmed for many years at Østbirk, near Skanderborg, not far from the highest hill in Jutland. He and his wife Ella, a nurse, are living in retirement in Østbirk. They had two adopted children, both now dead. Osvald’s twin sister, Nelly, married Olaf Koefoed Larsen, who was legally blind and on a disability pension. Olaf is now dead. 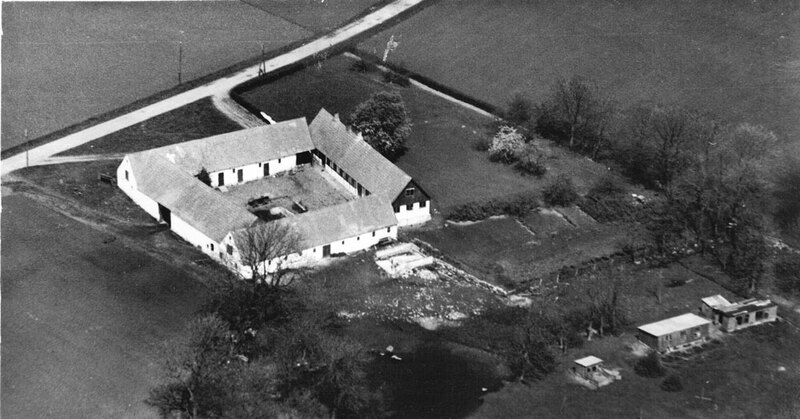 Nelly continues to live in their home at Ølsted in Sjælland. They have one adopted son. Olaf and Nelly visited my parents at Abercrombie some years ago, and Faster Anine, over 80 at the time, accompanied them. Henry was probably the member of the clan with the highest income, but one would never know it. He worked for many years for the Danish government’s Department of Communications, with administrative responsibility in radio broadcasting. He was a scholar, and when he was a boy used to help his older brother Osvald with his schoolwork. On one occasion around 1970 Henry’s work took him to the United States, and on his way he visited with my parents in Abercrombie. He and his wife Åse, a teacher of French, lived modestly in a bungalow in a suburb of Copenhagen. Both tended to be workaholics. They have three children. Edvard farmed the H.P. Holm property at Povlsker Højlyng for many years. Now he lives near Neksø, where he plays the organ for the little Methodist congregation. They have four children. They are also very modest, with simple needs. He shared a birthday with Henry, who was five years older. The youngest member of Anine’s family is Ranghild, who with her husband Tage lived for many years in Neksø. She had six children. In 1992 she moved to Århus, as two of her children live in that area. Dad’s second sister, Hansine, married her first cousin, Jens Holm, a master carpenter and cabinetmaker. They built a home in the outskirts of Neksø. Jens had asthma and died early. He was a fine workman but not effective as a businessman. Hansine’s eldest son was Børge. Until his death at 59 he was a foreman in a factory that produced carpenters’ tools. 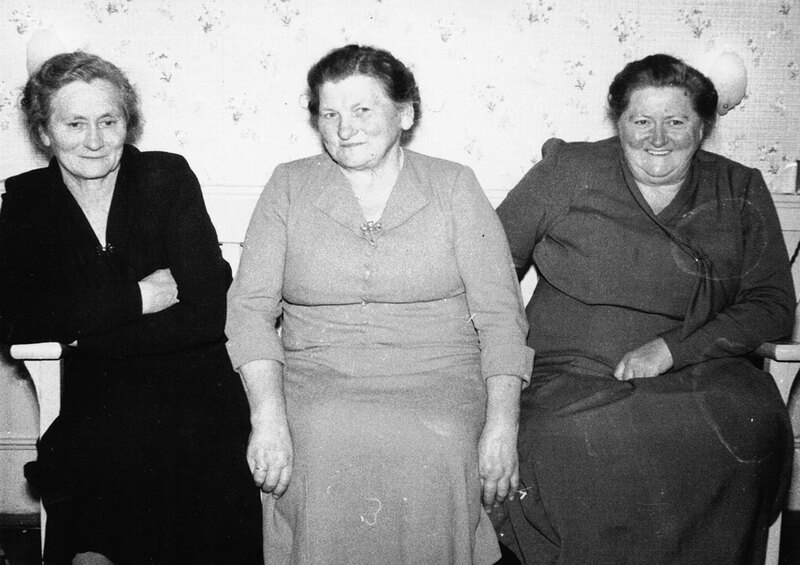 He was also a good amateur photographer and a number of us have prints of a picture he took of Bedstemor when she was over 90; the youngest of his three daughters is also in the picture. Børge married Lydia Madsen. Arne, Hansine’s second son, was a high school principal. He developed brain tumours and spent many years in a nursing home in Odense, dying in 1992. In addition to being wheelchair dependent and having a useless arm as a result of the tumours, he suffered from depression. His wife Ruth was also a teacher, and their three children are all academics. Intermarriage within the relatively small population of Bornholm is believed to have made him and his brothers susceptible to malignant tumours; his happened to have developed within his skull. His children are musical and artistic. His son Rune is an instructor in a teacher-training school on Fyn, and we have corresponded. Ove, who was a week younger than I, never married. He spent his working years as a fisherman, a labourer, and a cook on a rescue vessel. He had to take early retirement due to arthritis which was aggravated by obesity. He devotedly cared for his mother in her old age, until she died at the age of 90. He died of cancer in 1991. Aksel was a gardener and labourer. Rather late in life he married Ranghild’s daughter Birgit, and they had one daughter, Gitte. Birgit had a breakdown while in her teens, and as a result was mentally handicapped and died early. Aksel had to assume much of the responsibility for Gitte; in this he was greatly aided by the devotion of Ove and Ranghild. Ove was a second father to Gitte, and left his modest estate to her. Aksel also died of cancer in 1991. Gitte now lives with Ranghild, with her uncle Svend Åge having the financial responsibility. If Onkel Jens was a poor businessman, Aksel was a poorer one. He lived in the house his father had built, and had great schemes for modernization and improvement, schemes which produced largely negative results. “Svend Åge” is the youngest in Hansine’s family, and now the only survivor. He was a Methodist minister, but retired early due to heart problems. He is mechanically inclined and musical, playing the saw and the trumpet. My daughter Pamela had the experience of accompanying him on the piano, during her trip to Denmark. Svend visited us in the seventies when he travelled to the United States on church business. Hansine’s family were talented, creative people, expressing themselves in photography, music, mechanics and painting. They were kind and generous. They also had an eccentric streak which in some cases was disabling. My father, Viggo, and his older, but shorter, brother Johannes. Johannes resembled their father. 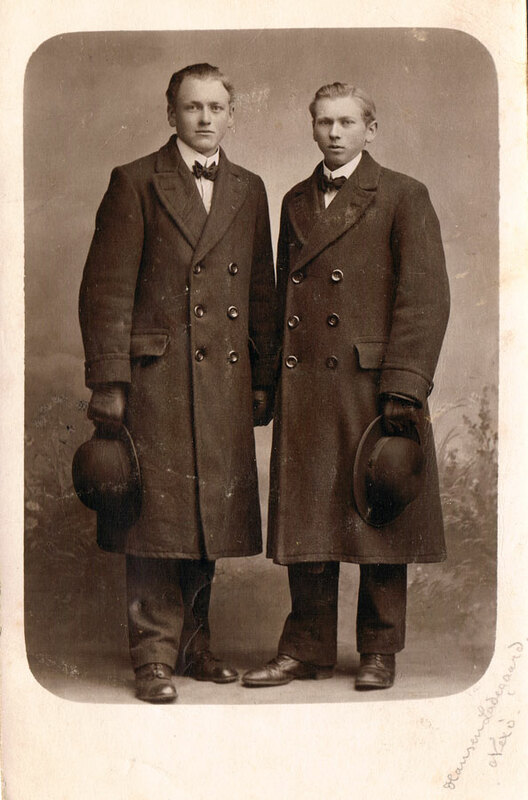 Viggo and Ludvig looked more like the Larsens in height, build and facial features. Alfred was in between. Johannes was two years older than Dad. 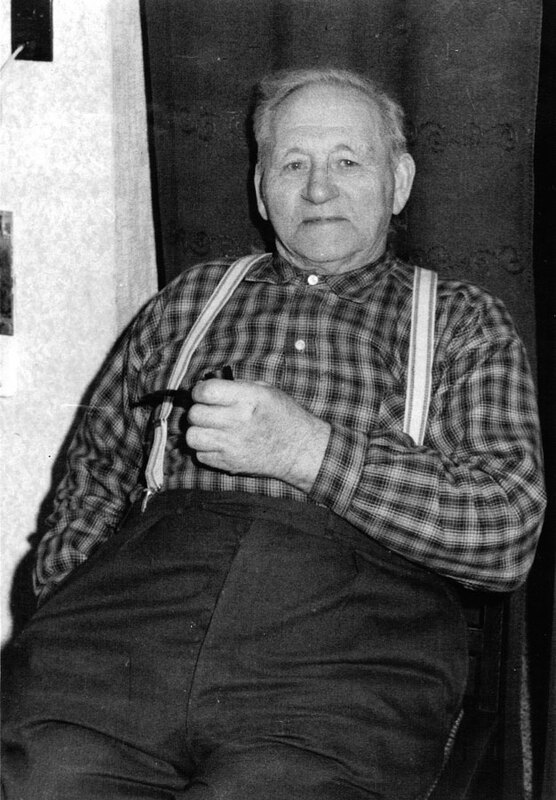 He and his wife Ellen farmed at Egeby until 1958, when his legs failed him and he obtained a disability pension. Then they moved to Pedersker where they kept a large garden. It has been suggested that Johannes was lazy. Perhaps he was, when compared to Ellen. But in comparison to Ellen 99% of the population was lazy. However, it was said that one morning when Johannes under pressure went to the field, he found a dry ditch out of sight of Ellen and took a nap before starting to work. Moreover, Dad remembered that when he and Johannes were boys and were sent to the barn to cut straw for the cattle, Johannes provided the entertainment by singing while Dad turned the cutting machine. 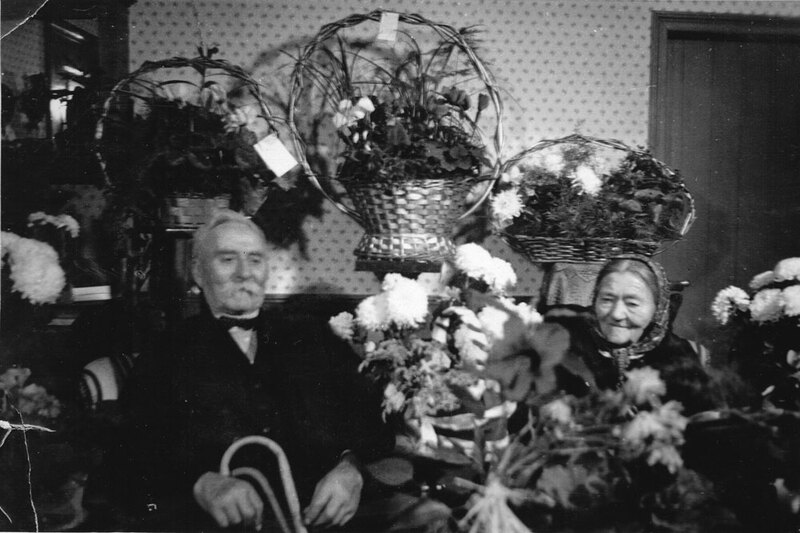 When Johannes and Ellen were about 80 and he was confined to a wheelchair and she could walk only with a cane and great difficulty, they still kept a large garden and sold and preserved its produce. They would lie on the ground between the rows to weed the vegetables. Johannes was a licensed local preacher in the Methodist Church, having taken a course to qualify. However he made his contribution in youth work rather than in the pulpit. When I visited Bornholm in September 1980, and was to speak briefly at a Wednesday night thanksgiving service in the little church at Pedersker, Johannes was in hospital in Akirkeby. Erwin gave him a drive to Pedersker and carried him into the building. Over the years Ellen organized the small congregation to collect used clothing which they made over and shipped in huge quantities to the Methodist mission in Zaire. At age 80 she was still playing the organ for the services. Johannes and Ellen had three daughters. Elinor’s husband, Svend Lund, was a labourer. Helene’s husband, Henry Ipsen, was a shoemaker. Elinor and Helene lived within the Pedersker area and carried on their mother’s work in the church. Helene died in 1994. 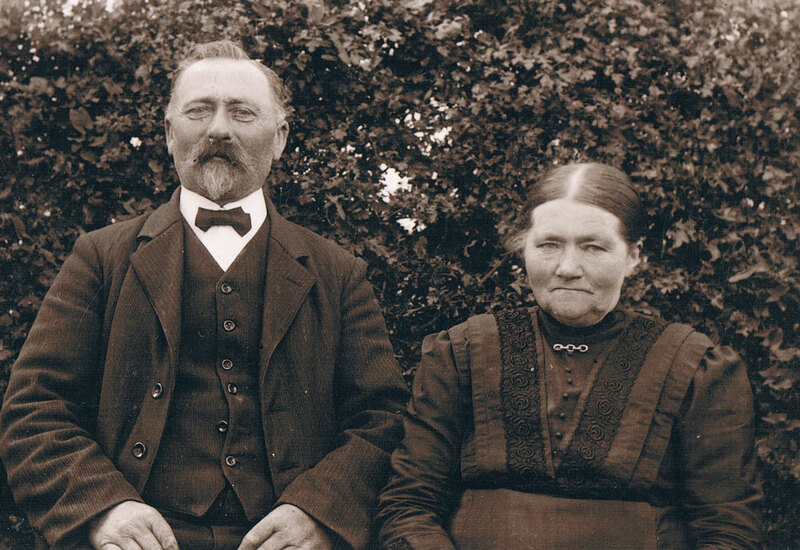 Rigmor, the youngest, married Kaj Pedersen; for many years they operated a farm in the northern part of the island, but are now living in Rønne. Johannes and Ellen celebrating their 50th wedding anniversary, standing under the traditional “gate of honour” erected by their family. Next was Viggo, my father. Sofie was the youngest member of the family. She married Julius Pedersen in 1930. Julius had spent some time in Western Canada. After their marriage they migrated to Nova Scotia and farmed at Loch Broom until 1934. Sofie had some health problems, had little opportunity to learn English, and missed her relatives. So they returned to Bornholm and farmed there, first at Snogebk and later at Pedersker. It was at Pedersker that I visited them in 1980. Their eldest son Niels was born in Canada; he and his wife had three daughters. They were estranged from the family for many years, not even attending the funerals of his parents. Julius and Sofie had supported them through several business failures and eventually had to draw the line; hence the alienation. Niels died in 1999. Birthe was also born in Canada. Her husband Karl Munk was a labourer, but developed a back problem and obtained a disability pension. They are living in Pedersker. They have three sons and a daughter. Keld and Hans are Methodist ministers, and Hans is also a psychotherapist. Jørn is dyslexic; he is married and lives in Rønne. Anette is married and lives in a suburb of Copenhagen. Sofie’s youngest son, Erik, was born on Bornholm. He trained to be a baker, but later joined the caretaking staff at the Copenhagen City Hall. He and his wife Grethe have two sons. They retired and moved to Snogebæk in 1999. The only early break in my father’s generation occurred in 1917 when a foster sister, Olga, died of Spanish influenza. Olga’s birth mother had left her with Bedstemor when she was a baby, promising to make regular payments for her support. She visited the family once, presumably assured herself that Olga was in good hands, and stopped the payments. A picture of the family taken about 1905 shows Olga’s dress sporting more frills and lace than did the dresses worn by the other girls. Dad said that Bedstemor was trying to give the foster child a little extra to make up for the disadvantages of her existence. With the exception of Olga, Sofie was the only one of Dad’s siblings to die under the age of 80.